Since its inception in 1985 Ashton cigars has become one of the prominent cigar manufacturers in the United States. Over the last 25 years the company has become internationally recognized and known for their commitment to creating high quality cigars. Its founder, Robert Levin, had previously been a retailer and importer of cigars. He had a vision to begin manufacturing his own cigars and this is how Ashton cigars would be originally born. Levin, a 2nd generation tobacconist, started Ashton cigars in Philadelphia and the company is still located there to this day. The Fuente family, who known internationally for their own cigar manufacturing, contributed their knowledge of cigar manufacturing to help in the creation of the premium Ashton cigars. Robert Levin is still president of Ashton cigars and committed to bringing new premium cigars onto the market. Ashton has committed itself to public service and continues to release limited edition cigars that demonstrate their knowledge of cigar manufacturing and have become some of the most sought-after cigars in the world. The original Ashton cigar that the company introduced in 1985 is still available today, and has become a classic full-bodied cigar. Nowadays you can pick out a different Ashton cigar to celebrate almost any occasion, or to simply enjoy for their exceptionally well-balanced flavor. 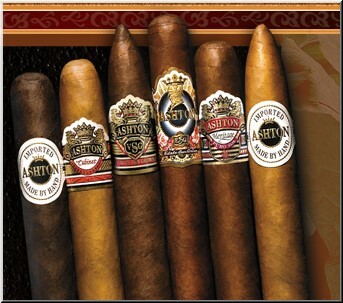 Ashton cigars are available in six flavors, all of which use the finest ingredients in their manufacturing. Ashton cigars use some of the richest Dominican leaves for their filler and binder. Most of their cigars, with the Virginia Sun Grown (VSG) being one exception, use Connecticut shade grown leaves of the finest quality. The Ashton VSG, perhaps their most famous line of cigars, uses an Ecuadorian leaf and was first produced in 1999. Its full-bodied flavor became an immediate success and helped propel Ashton cigars to the forefront of the industry by attaining the highest rankings ever a non-Cuban brand from Cigar Aficionado magazine.